Sticking this on the Blog, too. It can't hurt to remind ourselves that JunkkYard exists, but mainly to get this on the homepage for a while as well. As I say in the description, what tragic back story exists to these items being so casually thrown away I don't know, or want to, but fro once my wife was approving my coming back with more from the skip than I took to it. 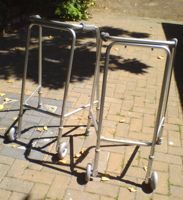 No takers soon, I'll drift them to a care home or hospital. If you do take them, promise that when the time comes, you'll hand them on.